Passive Attitude Control The most common passive control techniques are spin stabilization, in which the entire spacecraft is rotated so that its angular momentum vector remains approximately fixed in inertial space; dual-spin stabilization, in which the spacecraft has a rotating wheel or consists of two rotating components; and gravity-gradient stabilization, in which the differential gravitational forces acting on an asymmetric spacecraft force the minor axis (minimum moment of inertia axis) to be perpendicular to the gravitational equipotential. With the exception of gravity-gradient stabilization, passive control normally requires the use of active control systems, such as mass expulsion or magnetic coils, to periodically adjust the spacecraft attitude and spin rate to counteract disturbance torques. They also require some form of nutation damping to eliminate nutation caused by an unbalanced spacecraft or the elasticity of the spacecraft structure. where L is the spacecraft angular momentum, N is the sum of the disturbance torques discussed in Section 17.2, Ndf is the angular momentum change due to environmental torques over time interval di, and the integral is carried out over whatever length of time passive stability is required. 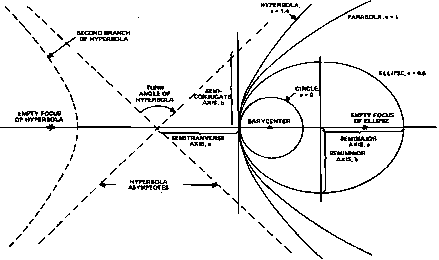 The integral defines the change in both the spacecraft orientation and die spin rate. If the disturbance torques are cyclic and the maximum attitude change from the torques is less than the mission requirements, no other control technique is required once the mission attitude is achieved. If disturbance torques exhibit either cyclic variations or a secular trend which exceeds the mission attitude constraints, an active control system is required to periodically adjust the attitude and the spin rate. Spin stabilization is a simple and effective technique and requires no moving parts; however, it is limited to spacecraft for which the spin itself does not inhibit the spacecraft function. 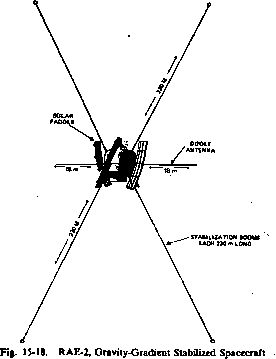 The International Sun-Earth Explorer-1, ISEE-1, shown in Fig. 15-16, is an example of a spin-stabilized spacecraft. The spacecraft contains scanning experiments for studying the space environment between the Sun and the Earth. Gas thrusters are used for reorientation maneuvers and for periodic adjustment of the attitude and spin rate to counteract the solar pressure disturbance torque. A passive fluid nutation damper (see Section 18.4) is used to control nutation. A Panoramic Attitude Sensor, which senses the Earth and Moon horizons, and a Sun sensor are used for attitude determination. Dual-spin stabilized spacecraft have two components spinning at different rates. Normally, one spacecraft section, such as a wheel, is spinning rapidly and the other section is despun or spinning very slowly to maintain one axis toward the Earth. A dual-spin system operates on the same principle as a single-spin system and usually requires a nutation damper and an active control system as does a single-spin spacecraft A dual-spin system provides platforms for both scanning and pointing (inertially fixed) instruments. However, with a two-component spacecraft, additional complexity arises because of the need for bearings and support structures separating the two components. 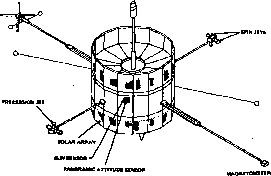 The Orbiting Solar Observatory-8, OSO-8, shown in Fig. 15-17, is an example of a dual-spin spacecraft. The sail and pointing instrument assembly are the despun components and contain the solar power array and Sun pointing experiments. A passive-eddy current nutation damper located in the sail controls the nutation. The wheel is the spinning component and contains scanning instruments. An electromagnetic torquer mouhted along the wheel spin axis and a pair of gas jets on the wheel are used for maneuvering the spacecraft and maintaining the spin rate. A wheel-mounted Sun sensor, a magnetometer mounted on one of the ballast arms, and a star scanner are used for attitude determination. A gravity-gradient stabilization system interacts with the gravitational field to maintain the spacecraft attitude. Because the gravity-gradient torque decreases as the inverse cube of the distance from the gravitational source, gravity-gradient systems are usually used for near-Earth or -Moon missions requiring one side of the spacecraft to point toward the central body. Due to orbit eccentricity, damper, and thermal heating effects, the potential pointing accuracy is typically 1 to 4 deg. The basic requirement for gravity-gradient stabilization is that the gravity-gradient torque be greater than all other environmental torques. To achieve this, one principal moment of inertia must be smaller than the others, causing the minor axis to align along the nadir vector. To obtain the differential in moments of inertia, booms are often deployed along the minor axis. The gravity-gradient torque causes the spacecraft to oscillate or librate about the pitch axis and a passive damper is generally used to minimize the amplitude of this oscillation.. Gravity-gradient systems require no moving parts other than, in some cases, extendable booms or antennas. nonspinning, gravity-gradient stabilized spacecraft. The libration control system consisted of a passive hysteresis damper and an extendable and retractable tubular boom. Two Panoramic Attitude Sensors were used to sense the Earth and Moon and two single-axis and eight two-axis digital Sun sensors were used for attitude determination. Active Attitude Control. The most common active control techniques are mass expulsion devices, such as gas jets or ion thrusters; momentum wheels, which are used to absorb disturbance torques; and electromagnetic coils, which provide a torque by interacting with the Earth's magnetic field. Mass expulsion control systems used for attitude maneuvering include gas and ion thrusters. Gas thruster systems are efficient in the execution of a maneuver, are simple to operate, and are not limited to a specific environment; however, they are expensive, require complex hardware and plumbing, and are limited in lifetime by the amount of fuel onboard. Gas attitude control systems can also cause orbit changes during a reorientation maneuver. Consequently, the thrusters are usually fired in pairs to minimize translational motion. Gas thruster systems are commonly used with spin-stabilized spacecraft (such as CTS described in Section 1.1) for attitude maneuvering and spin rate control. For this type of spacecraft, a minimum of two reorientation thrusters and two spin rate control thrusters are required. For a three-axis stabilized system, six possible directions (± pitch, ±roll, ±yaw) are available for maneuvering the spacecraft and a minimum of six thrusters are required. Momentum wheel control systems can have wheels on 1, 2, or 3 axes and normally require a secondary active control system, such as gas jets, to maintain the wheel and spacecraft momentum in the presence of disturbance torques and friction losses. A dual-spin spacecraft is a single-momentum wheel system. A two-wheel system for an Earth-oriented spacecraft normally has one wheel along the pitch axis for pitch control and another wheel mounted on either the roll or the yaw axis for roll/yaw control. A three-axis system uses momentum wheels along all three axes and may have six or more wheels along nonorthogonal axes. Figure 15-19 illustrates three types of momentum wheel systems with mass expulsion and magnetic coils to control the wheel spin rate. The operation of the momentum wheels is complex and relies on the interaction of mechanical parts, which limits the system lifetime.